The Creighton men's basketball team pulled away from Montana in the 2nd half on Wednesday to win, 98-72. OMAHA, Neb. 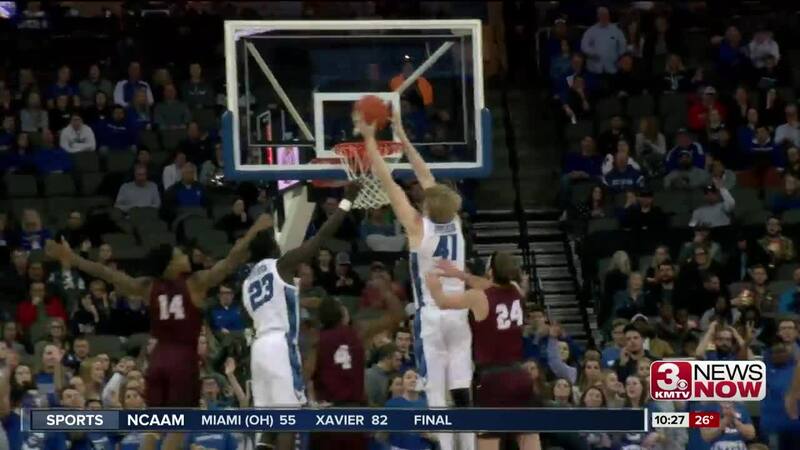 (KMTV) — Creighton basketball took care of business against Montana with a 98-72 win at the CHI Health Center. The Jays move to 6-1 on the season after the victory Wednesday night. The 98 point total and 60-percent shooting from the field were both season highs for the Creighton offense. The Grizzlies kept it close in the first half, but a 20-4 Creighton run at the end of the first half and into the second half helped the Jays maintain a solid lead until the end. Damien Jefferson led the charge for Creighton offensively with his 18-point performance and a perfect 3-3 from three-point range. Jefferson also grabbed three boards and had two assists in the contest. Martin Krampelj followed closely behind with 17 points to go along with six rebounds, an assist and a steal. Up next for Creighton is the highly-anticipated matchup with the No. 1 Gonzaga Bulldogs at home Saturday at 1 p.m.